Deciding on your next sedan is no easy feat, especially when you’re faced with choosing between the 2019 Honda Civic vs. Nissan Sentra. While both sedans offer stylish compact bodies, notable performances, and impressive features, you can really only choose one as your next set of wheels. At Norm Reeves Honda Superstore Huntington Beach, we’re here to take a closer look so you can tell these sedans apart and learn more about them so you can decide easily! Keep reading this 2019 Civic vs. Sentra comparison to learn about their similarities and differences so you can clearly see which model is best suited for you and your experiences on the roads of Huntington Beach, Westminster, and Orange County. Although similar, the Honda Civic and Nissan Sentra offer very different performances with their respective engine setups. The Civic comes standard with a 2.0-liter 4-cylinder engine that’s capable of producing 158 horsepower and 138 lb-ft of torque. The Sentra includes the 1.8-liter 4-cylinder engine at the standard level. This engine’s performance maxes out at only 130 horsepower and 128 lb-ft of torque. Both engines come paired with 6-speed manual transmissions with the option of including respective Continuously Variable Transmissions. 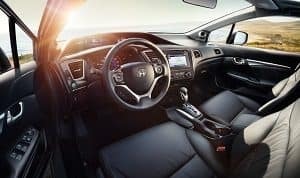 The differences between the Honda Civic vs. Sentra carry over to the cabin with the assortment of entertainment features and technology systems. Both sedans are equipped with 4-speaker sound systems and respective dashboard-mounted display screens that are used to access the media options. Both vehicles include USB and auxiliary inputs for portable media players, as well as Bluetooth® which functions for both hands-free phone usage as well as audio streaming. The Honda Civic offers HondaLink® with its second trim level. This feature gives you access to your vehicle from the palm of your hand, with the ability to remotely start, unlock, and locate your vehicle. The Sentra doesn’t offer a feature like this with its lower trim levels. The Honda Civic comes standard with Honda Sensing®, which is a collection of driver-assistance technology features. These features include the Collision Mitigation Braking System™, Forward Collision Warning, Road Departure Mitigation System, Adaptive Cruise Control, and more. The Nissan Sentra, on the other hand, doesn’t offer these features at the base level. In fact, to get the basic collision mitigation feature, you’ll have to upgrade trim levels. We hope that this Civic vs. Sentra comparison helped you get a sense of what these vehicles offer and how they differ. However, while you’re aware of the many notable advantages of the Honda Civic, you may need more details to confidently decide on your next car. You can always come see us for a closer look at the Civic, or you can even get behind the wheel! Learn all about the Honda Civic by scheduling your test drive at Norm Reeves Honda Superstore Huntington Beach! We’re here to help drivers all throughout Huntington Beach, Westminster, and Orange County for when it’s time to find their next car!